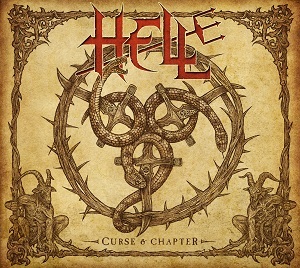 Revived British Metal pioneers HELL have unveiled the cover artwork and track list of their upcoming second full-length record Curse And Chapter, which will be unleashed onto the United Kingdom on November 25, 2013. Commented Kev Bower (guitar, keyboards, vocals): “The artwork for »Curse And Chapter« is once again the result of our collaboration with artist Dan Goldsworthy and photographer Nigel Crane, who we first worked with on the »Human Remains« album cover in 2011. The digipak for this is one of the most complex pieces of CD/DVD packaging ever attempted by Nuclear Blast, and the concept for this was dreamed up by myself and Andy Sneap whilst staggering back from the local pub late one night, after a 'heavy creativity session'. It was inspired by the rise in spiritualism in England during the 19th century, during which time séances and attempts to communicate with the dead became commonplace - along with the establishment of numerous secret cults and aristocratic organizations who would meet in secret, attempting to raise spirits and reach 'the other side'. We also wished to explore the phenomenon known as 'post-mortem photography'. Because photography was very costly at the time, the only time ordinary families could justify the expense was after the subject was already dead. We became gripped by these macabre Victorian images of deceased family members and children being posed alongside their living families, often being supported in a standing position by equally macabre mechanical devices designed specifically for this gruesome purpose. The other major issue with spirit communication is that you never know who (or what) will 'come through' - and it was common for malevolent entities to create havoc in the séance room.